Seville is the capital of the autonomous community of Andalucia, as well as being the financial capital of Southern Spain. Situated in the valley of the Guadalquivir River (one of the biggest in Spain), Seville is Spain's fourth largest city with a population over 700,000 inhabitants. Check prices for excursions, tours and day trips in Andalucia, for both small and big groups, including transfers from the Costa del Sol to Seville. Excursion to the Cathedral of Seville: one of the largest of all Medieval and Gothic cathedrals, it was built from 1409-1519 on the former site of the city's mosque after the Reconquista. 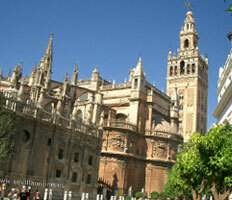 The Giralda is the bell tower of the cathedral with a height of 101 metres. Day trips to the Alcazar: just next to the Cathedral, construction of this dazzling Moorish fortress/palace complex began in 1181 and continued for over 500 years. 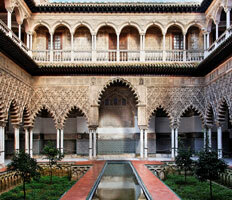 Throughout the building and the gardens you will find a blend of Andalucian, Christian and Moorish influences. Torre del Oro: this watchtower next to the Guadalquivir River was where gold from the Americas was unloaded. Excursions to Plaza de España: located on the Maria Luisa Park's edge, the Plaza the España was built in 1928 for the Ibero-American Exposition of 1929. Museums: some of the best museums in Seville include the Museum of Fine Arts, Maria Luisa Park Museum (Archaeological and Traditional Arts), the Flamenco Art Museum and the Bullfight Museum. Seville Fair: one of the most famous fairs in Spain, it is celebrated every year two weeks after Easter Sunday for one week. Football stadiums the stadia of Betis and Seville (Sanchez Pizjuan and Benito Villamarin respectively) are well worth a visit, as is the Olympic Stadium. 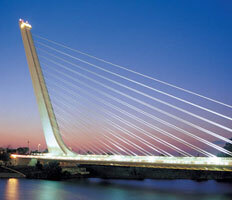 Amazing bridges: crossing the Guadalquivir River, the Triana Bridge, Cartuja Bridge and Alamillo Bridge all offer fantastic views of the city. 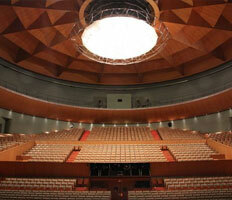 If you're a fan of bullfighting, Seville has one of the most beautiful bullrings in the form of the Maestranza Bullring. 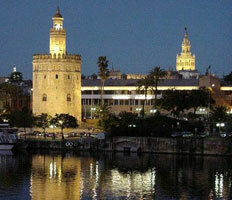 Like the sound of Seville and planning a visit? 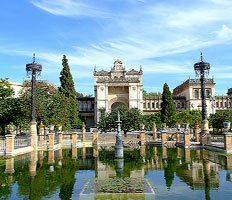 Find out more about the cheap airport transfers to Seville we offer here. It’s simply the most convenient way to get around.